Here’s how you can watch this landmark case on Monday September 7, 2015. 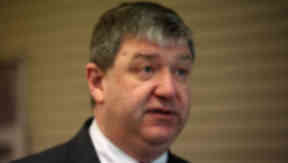 STV is making television history as it broadcasts the Alistair Carmichael election case. It will be the first time a Scottish court case has been televised live and in full. BroadcastYou can watch on television on STV Glasgow and STV Edinburgh. These can be found at Freeview channel 23, Sky channel 117 and Virgin channel 159 in both city TV broadcast areas. The programme will start at 10am on Monday and 10.20am on Tuesday and feature full and uninterrupted coverage from the court. There will be special coverage of the court case in STV News at Six and on Scotland Tonight from 10.30pm. OnlineVisit the STV Player to watch the live programmes. This is available on the STV Player app for both iOS and Android. The Player stream is available only in the UK. If you’re not already signed up to use the STV Player, now would be a good time to join. STV News will offer live text updates from the court on this page. Other mediaSTV is making the broadcast footage available to other broadcast media via satellite link.